Salt water	There are 2 products. Due to its components salt water fishing requires special rods. The ones that you can find here are manufactured with salt water resistant components. Moreover, these rods have fast action. Another advantage is the load that they can support, considering that they can hold much more load than any other fly rods. 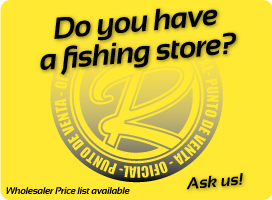 If you fish in salt water, do not hesitate and get a top qualite equipment, durable and resistant. Enjoy the quality of a good rod. with what is our real passion. Sport Fishing.